After many months of planning, renovating, selling, praying and a very sad good-bye to family at Wellington airport, we finally arrived in Los Angeles on July 23. The flight was generally fine and smooth accompanied with the odd patch of turbulence. The only downsides were a delay at Auckland International Airport for over an hour and Maddy getting air sick for most of the trip. She couldn’t eat or drink anything during the flight, but was fine once we got off. Upon arriving at LAX and standing in the customs pre-processing queue for about two hours, it was great to be greeted by familiar faces. We were picked up by the Burlings who also introduced us to the local cuisine when we grabbed some late lunch at In-N-Out Burger – a fantastic spot for lunch, outside in the sun watching the planes land. After battling some traffic to Santa Clarita, it was great to finally get to our apartment to drop off some luggage and meet the apartment owner and managers. We spent the rest of the first evening and the first night with the Burlings at their place. It was great to catch-up with them, to rest and to learn from them some of the things they had learned about living in Santa Clarita. 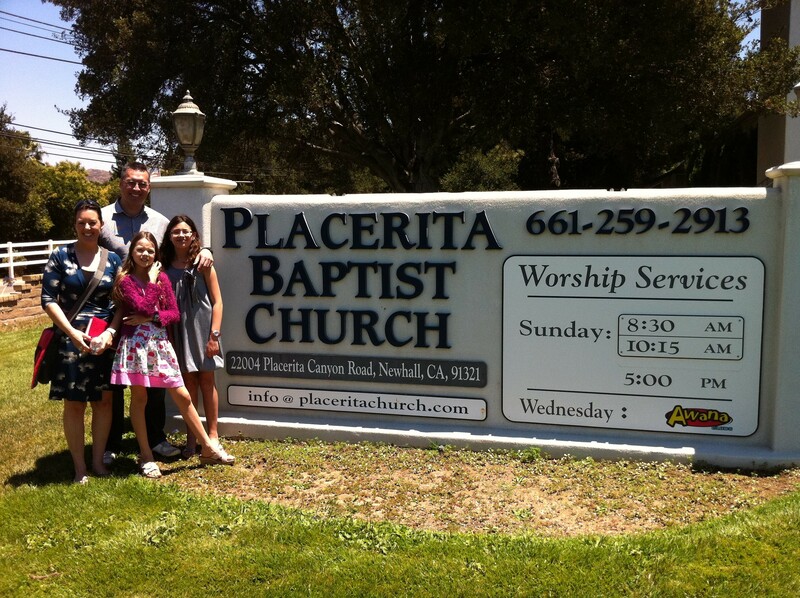 Today, we visited Placerita Baptist Church which is a three minute drive from our apartment. We loved it there even after the first day and would be quite happy to make it our home church for now. The pastor preached a great sermon, the music was different but good and we were made welcome. The one thing that we thought was a bit different was that after the congregation was ‘dismissed’, the church emptied out pretty quickly. We went to the second session, so perhaps some of these people were also at the first session and were keen to get home. After the evening service, Placerita held a ‘summerfest’ event where we enjoyed a meal and a chance to meet some of the local people. This all took place in 33 degree heat. 33 degrees? You’re welcome to them! It’s snowing all over lots of NZ so I think you got out just in time. Glad to hear that you arrived safely and it sounds like you’re really happy, that’s wonderful. All the best to you and your family, Mark. Work is very quiet without you and we do miss you a lot. Glad you arrived safely – must have been a bit miserable for Maddy, though. Today was Wellington’s coldest day on record – 6 deg. Cold, strong southerly wind made it really bitter. Love reading your updates – keep them coming! Hi Watson family. Great to hear (& see) you got to your ‘new home’ safely. Sorry to hear Maddy didn’t enjoy the fun of flying so much. My Sarah had a similar problem, but once she’d done a few more flights she was fine. 33 degrees huh, well when I got home from work tonight is was 3 (yes, three) degrees outside my place! Snow on nearly every Hutt Valley hill and the Rimutaka hill road was closed along with others too. We missed you folk at church and Naenae on Sunday. The dance crew were awesome (great skills & great graphics in their video presentation). There was a good sized crowd too – approx 90 or so. Praise God for the Burlings – sounds as though they were a great help. All the very best my friends.